1. Mix butter and sugar in a stand mixer until soft and creamy (over whipping could cause the cookies to spread while baking). Add egg and vanilla until just incorporated. 2. Gradually add in flour to the wet mixture. You will need to scrape down the sides of the bowl with a spatula every once in a while. The dough is ready when it begins to slightly pull away from the sides of the bowl. Shape dough into 2 discs, and wrap in cling wrap. Chill in the fridge for at least 1 hour. 3. When dough is ready, pre-heat oven to 175 C (fan forced). Roll out dough between 2 sheets of parchment paper to approximately 1/4 inch thick. Cut cookie dough into desired shapes, and place on lined baking tray. 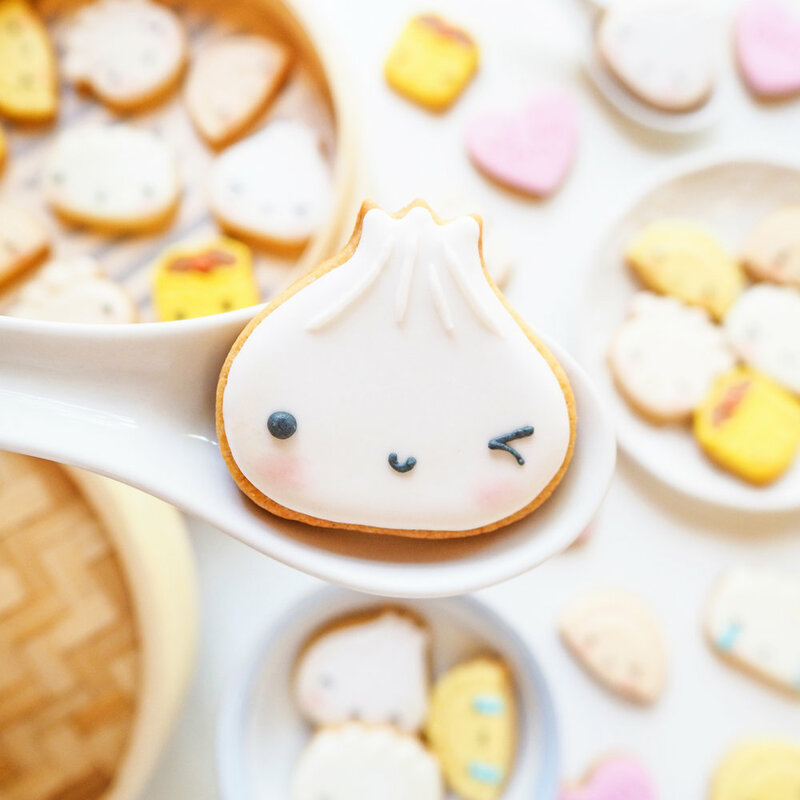 I got my dumpling cookie cutters custom made over at Cookie Cutter Kingdom! Place in freezer for approximately 15 minutes before baking. 4. Bake for 12 -15 minutes, or when cookies begin to slightly brown around the edges. The time could be shorter or longer, depending on the size of the cookies. 5. Cool cookies on baking tray for 5 minutes before transferring onto a wire rack. Cool completely before decorating. *If you are based in Australia, you can use Pavlova Magic if you can’t get your hands on meringue powder; which can easily be found at the supermarket. Alternatively, you can replace the powder and water with egg white if preferred. 1. Mix sifted icing sugar and meringue powder in a large bowl. 2. Add in warm water and lemon juice (or other flavouring of choice), and mix on low - medium speed for approximately 5 minutes until white and glossy. 3. Divide and mix in food colouring accordingly. Depending on the icing consistency you are after, more water will be required for a thinner/spreadable icing. 4. Transfer icing into sturdy piping bags - either with fitted tips, or the tip cut off. 1. Ice the base of the cookie with white icing and leave to dry completely* (or until the surface of the icing has set). 2. Pipe on thin white lines to add a little bit texture. 3. 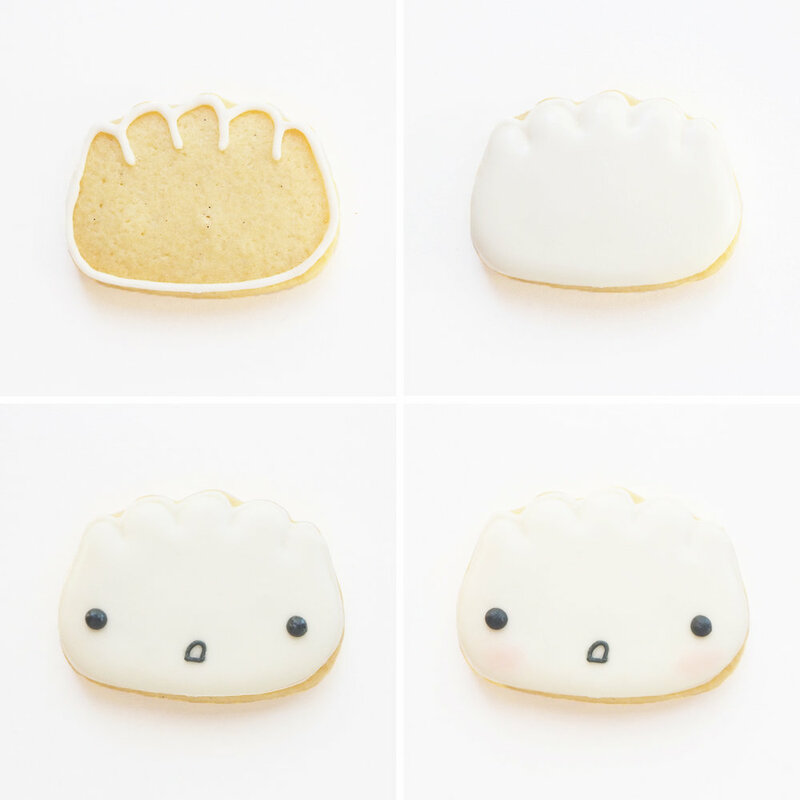 Draw on the face with black royal icing. 4. Add on ‘blush’ using red powdered food colouring and a small brush. *Royal icing generally takes at least 6-8 hours to dry completely, though it could take longer in more humid climates. I suggest leaving them to dry overnight for best results. 1. Ice the bottom two thirds of the cookie with yellow icing and leave to set. 2. Add on brown icing at the top of the cookie, and leave the base to dry completely. 3. Pipe on a yellow border around the brown icing, then stick on orange sprinkles or small fondant balls with edible adhesive. 4. Add on faces with black icing, and ’blush’ using red powdered food colouring and a small brush. 1. 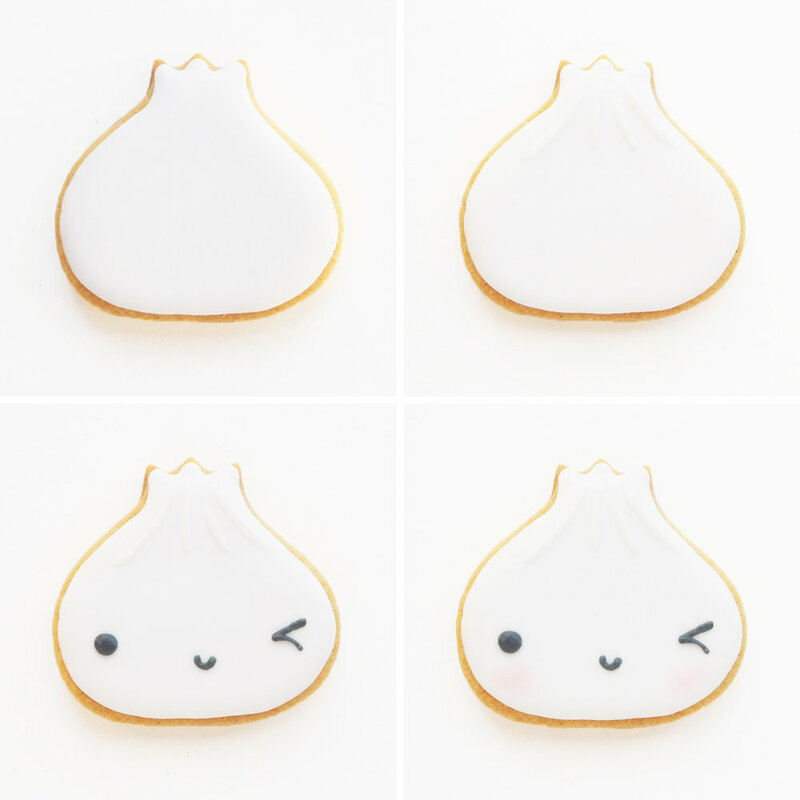 Outline the cookie with off white royal icing and leave to set. 2. 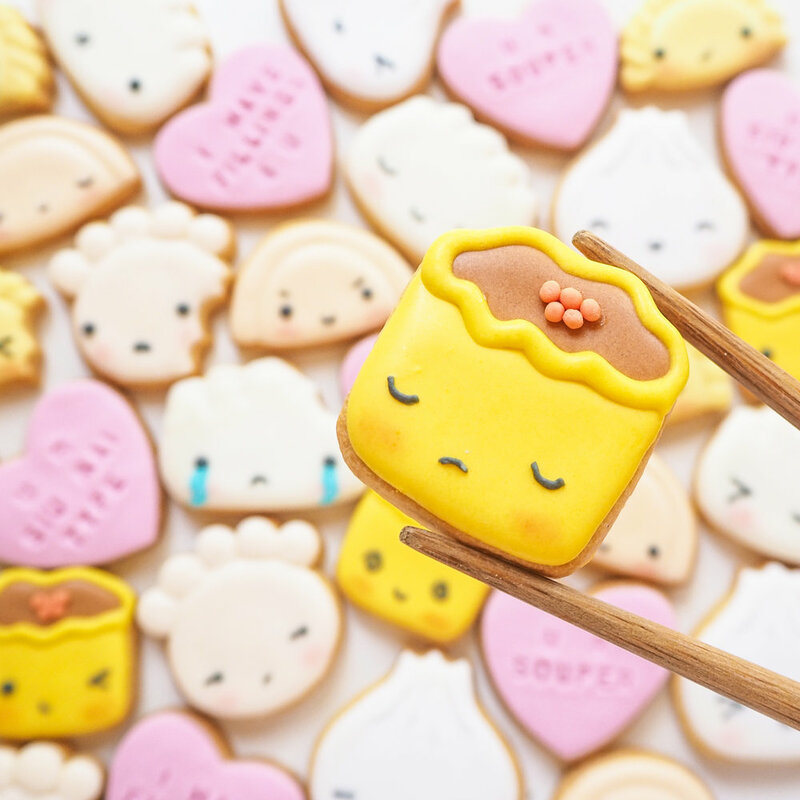 ‘Flood’ the cookie with the same coloured icing, and leave to dry completely. 3. Pipe on faces with black royal icing. 4. Add on ’blush’ using red powdered food colouring and a small brush. 1. Ice the inner semi circle of the cookie with pale yellow icing and leave to set. 2. Using the same icing, pipe on every second fold of the dumpling and leave to set. 3. Fill in the rest of the folds, then leave to dry completely. 4. Add on faces with black icing, and a stream of tears with blue icing. 1. Roll out pink fondant (or any fondant colour of choice). 2. 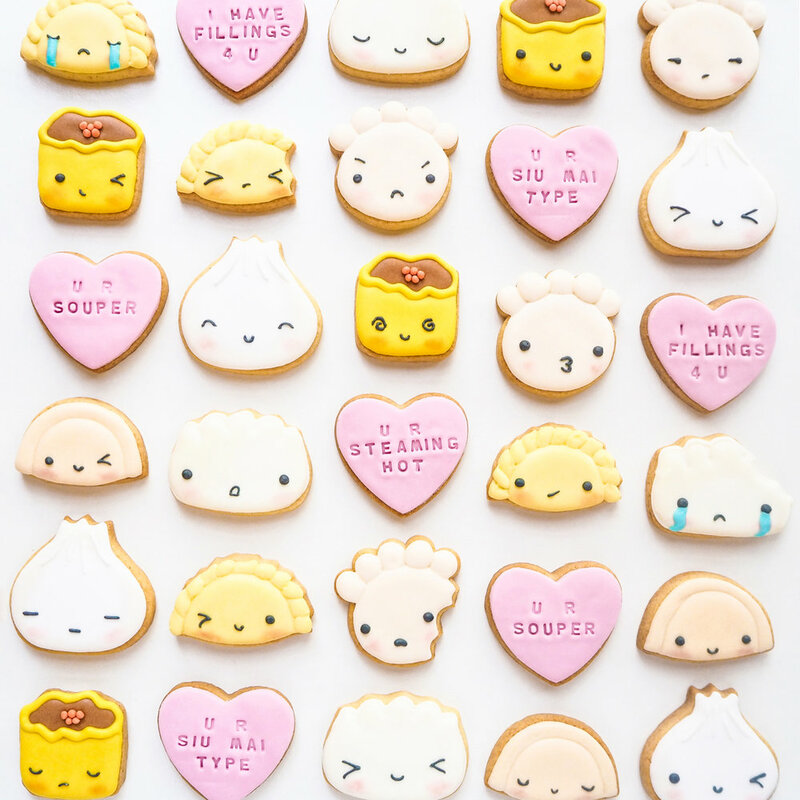 Cut out heart shapes, using the same cutter used for the cookies, and stick onto the cookies with a little bit of water or edible adhesive. 3. Using a cookie stamp, stamp on your favourite quotes or punny pick up lines. 4. Leave to set completely before packaging. If you give these a go, be sure to tag me over on Instagram!